I must say that this is a lovely book. Richie Benaud was held in high esteem in many areas and this book has been lovingly put together with many people’s fond memories of the famous Australian making it so enjoyable. The cover photograph comes with a sticker of The Acclaimed Bestseller. 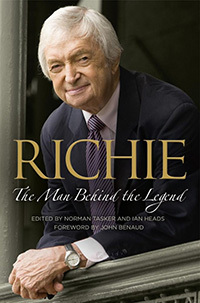 Since Richie Benaud’s death in 2015, many books have been released immortalising the great man and I must say that, with this reputation, I was looking forward to reading it. Very much I did also as the reminiscences come from many people involved in different parts of Richie’s life: cricketers naturally, journalists, commentators, friends, golfers and even an Australian prime minister. It makes for fascinating reading but, more importantly, it is a thoroughly nice book also. Fun, too. Richie was held in great esteem both on and off the field and as a journalist and commentator. He comes over as a perfectionist but that does not mean that there were no funny moments and those mentioned within the book bring further joy. I am sure that sometime and somewhere, it was Richie’s simple words which, many years ago, showed me the difference between being a radio and television commentator. Television viewers can see what is going on, radio listeners cannot – unless of course, one listens to the radio whilst watching the television as happens – and therefore the need for comment is not as necessary. Richie Benaud was a master at just adding to the scene with a few succinct words. It is nice to see how seriously he took journalistic articles: when asked once how his copy should appear, he told the younger person everything would be fine as long as there were no split infinitives. It made me chuckle but, more importantly, it is nice to see someone stressing the importance of correct grammar. Richie: The Man behind the Legend is indeed a delightful book and fully deserves its accolade of the Acclaimed Bestseller. It tells so much of the man in different areas and probably increases the stature and stats of one of Australia’s finest cricketers and men.